India’s most preferred budget airline, Spicejet, has allotted 4.29 crore shares to promoter Kalanithi Maran taking his shareholding in the company to 13 percent. The shares were allotted at a price of Rs 23.18 per share aggregating to Rs 99.44 crore. With this, the overall promoter holding of the company has now increased to 48.6 percent. 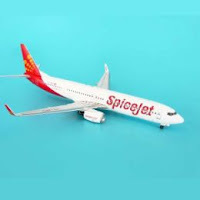 Spicejet currently operates 153 flights daily to 20 Indian cities with a fleet of 22 Boeing 737-800-737-900ER aircraft. It had also placed an order for 30 Bombardier Q400 turboprop planes to launch services to smaller destinations in the country.